Her parents, John Long and Helena Mitchell, had pioneered internet banking systems two decades ago. “In 1999 Helena and I sold Quadravision after growing it for seven years to over 400 employees serving financial institutions with internet solutions in the US, Canada and Europe,” explains John Long. Developed by Hawley Bowlus in the years after he led construction of Charles Lindbergh’s Spirit of St Louis, the Bowlus Road Chief was 80 years ahead of its time. Bowlus, a world leader in the design of sailplanes and gliders who also worked on the early development of the Learjet, brought the engineering and design principles of aircraft and race cars to the travel trailer: A light weight, a low centre of gravity, stable aerodynamics and not a square inch gone to waste. The original Bowlus remains a marvel of efficient packaging and Streamline Moderne design. 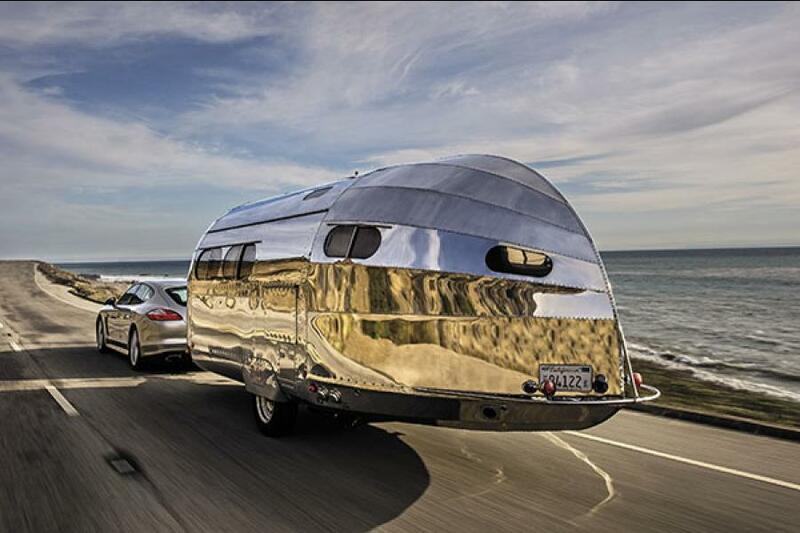 The iconic Airstream trailer owes its very existence to the Road Chief. (The Airstream company was founded by former Bowlus marketer Wally Byam.) And original Road Chiefs still have tremendous cachet: A 1935 Bowlus went for $187,000 at the Gooding & Co Scottsdale auction in 2011. The Longs have brought the Bowlus brand into the 21st century since relaunching it in 2014. Ten Road Chiefs were delivered in the past year, and 25 are under construction, cash deposits already banked. Prices range from $115,000 for the simpler Heritage Edition that sleeps three to the $140,000 Open Road Edition, which can accommodate four. Inside, ceilings and paneling are maple veneer on birch core, and owners can choose from a range of colour themes and special equipment. “We gave a great deal of consideration to how people work and play today,” says John. “That’s why we offer tablet and laptop charging on the go with a cellular amplifier so you can catch up effortlessly with work or stream all your favourites. We added solar-panel hookups with an easy storage option and long-life AGM batteries so you can travel where and how you want. We want our customers to follow their dreams with as little to encumber them as possible. “The vintage Road Chief served as our style icon and design DNA,” he continues. “While we elongated the new Road Chief to 24 feet, widened it to 80 inches and grew the overall internal height to 6 feet 4 inches, we kept the original aircraft quality of 2024-T3 aluminum along with 5,000 aircraft-grade rivets to create an ultra-strong monocoque [French for “one hull”] lightweight structure akin to an airplane wing or fuselage.” Overall, the Road Chief tips the scales at a featherweight 2,300 pounds, less than half the weight of a comparable-length trailer. Due to its superior aerodynamics and low centre of gravity, just about any SUV or crossover, and even some luxury sedans, can tow it. As John explains: “This appeals to many users who don’t want to add a new vehicle just to tow their travel trailer.” Geneva regularly pulls her Road Chief behind a V6-powered 2011 Porsche Panamera, and Helena does the same with her beloved Saab convertible. Texas cardiothoracic surgeon Staton Awtrey and his wife, Blythe, exemplify the new Bowlus owner. They traded their 27-foot Airstream and requisite huge tow vehicle for a Mercedes SUV and a Road Chief. Blythe and their 5-year-old daughter, Lillian, keep logbooks of their travels so Lillian can replicate them one day with her own children in the very same Road Chief, which Staton named Spirit of Adventure, because it resembles the airship in Lillian’s favourite movie, Up.